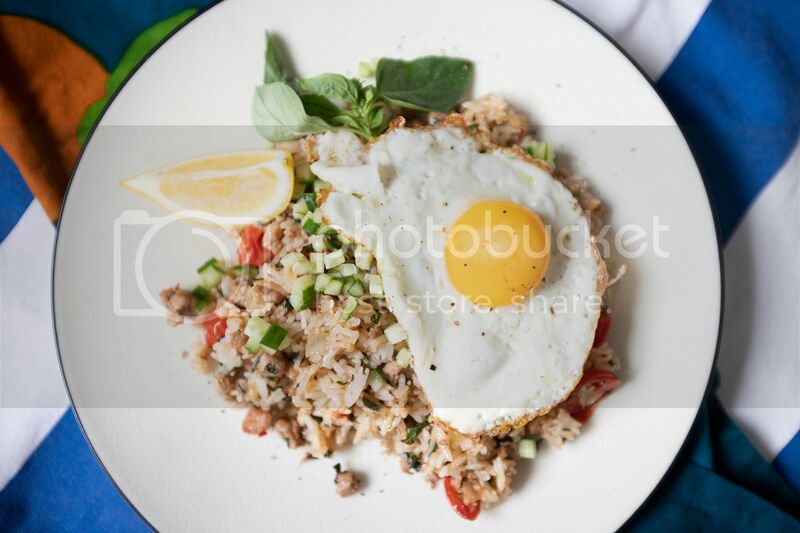 Da pao pork, simply put it this way, is a Thai style stir-fry dish made with ground pork, Thai basil or Chinese basil, cherry tomatoes, and some Asian seasonings. Instead of going solo, this time I'm combining da pao pork with rice. 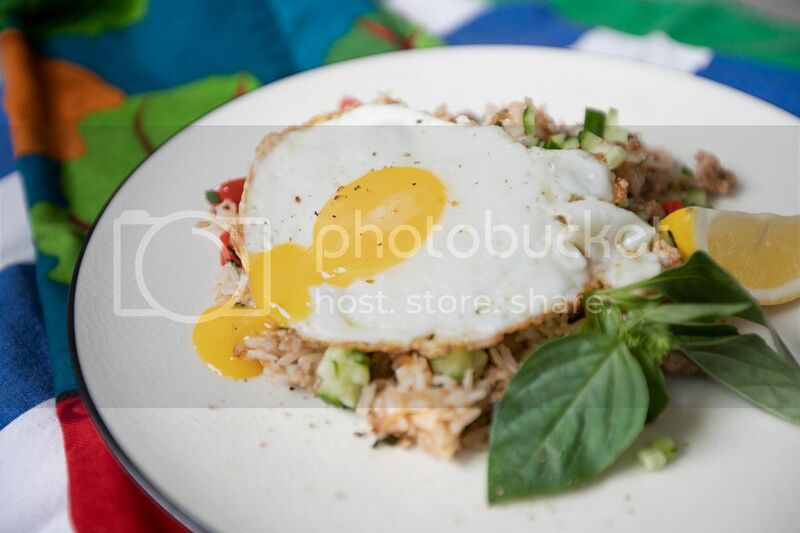 To make it even better, it has to be topped with a sunny side up egg, that oozing yolk is always a plus. Ingredients (for 2 to 3 portions)? Cook the rice first with a little bit less water than usual. Otherwise, cook the rice the day before and store in the fridge. The goal is to get the grains with less moisture, more suitable for fried rice that way. Peel and dice the onion. Peel and chop the garlic cloves. Destem red chilies and finely chop the remaining section. Dice the skinny cucumber into smaller cubes. Finely chop the Chinese basil but do save a few sprigs for garnish. Halve the cherry tomatoes. Slice the lemon into few wedges. 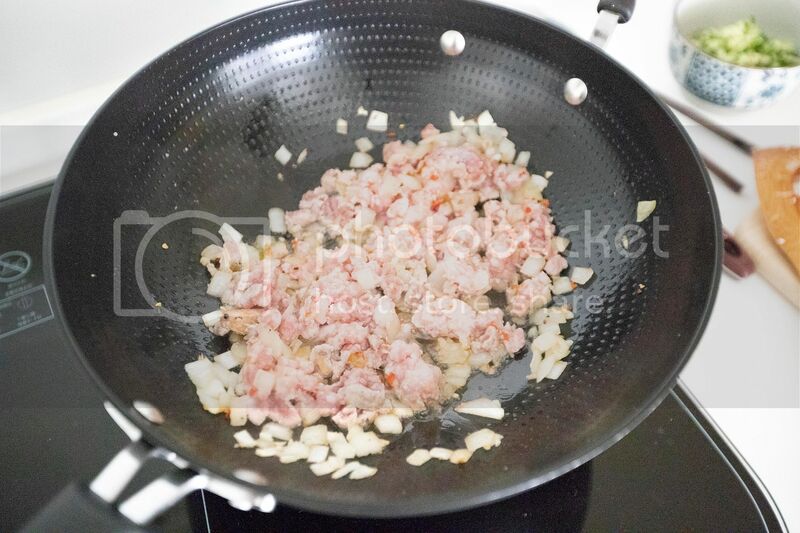 Use a wok or a big pan, drizzle in about 2 tablespoons of olive oil and turn to high heat. Also add in onion, 1/2 teaspoon of salt, and 1/8 teaspoon of black pepper. Mix and sear till the onion turns slightly browned. Add in chopped garlic and red chilies, cook till aromatic but not burning the garlic bits. 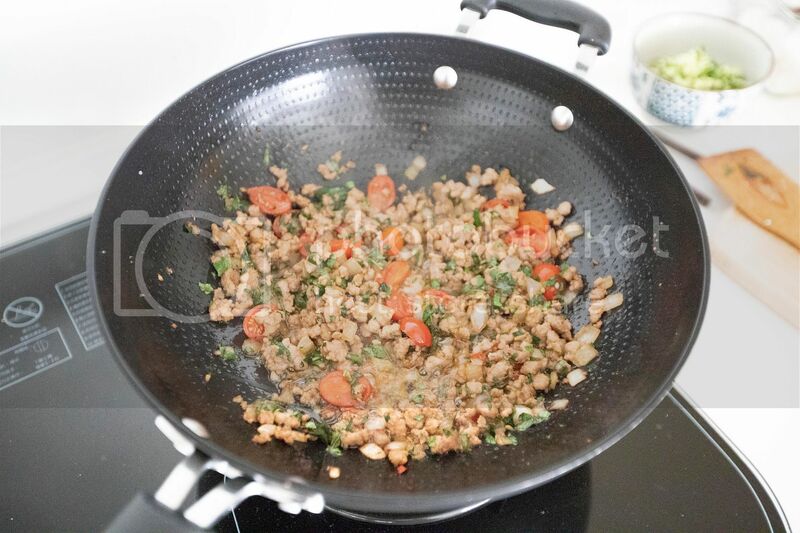 Transfer the ground pork over, stir-fry for about 1 minute. Add in 1 teaspoon of fish sauce, 1 teaspoon of soy sauce, 1 teaspoon of sugar, and 1/4 teaspoon of Sriracha. Mix and cook till the mixture nearly dried up. Add in halved cherry tomatoes and cook for another 30 seconds or so. Then it goes chopped Thai or Chinese basil, give it a quick mix. Mix in precooked rice in two batches. Make sure all the grains are coated with the seasonings before adding the second batch. Lower the heat a little if need more time flipping the rice around. 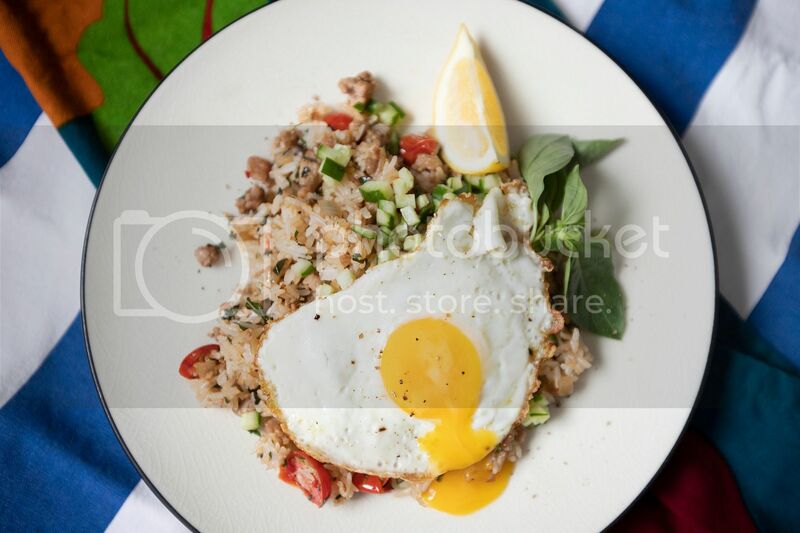 Take a non-stick pan to make the sunny side up eggs. Drizzle some oil and turn to medium high heat. Once hot, break in the eggs and sprinkle tiny bit of salt and black pepper over. Sear till the edge gets slightly browned but the center yolks are still semi-runny. 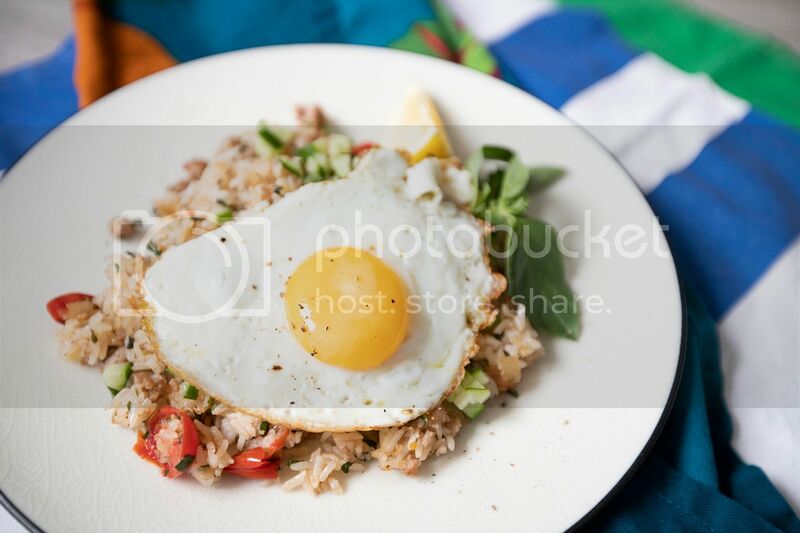 Plate the fried rice and top with diced cucumber. Transfer sunny side up eggs over, 1 egg for each portion. Garnish with fresh basil and lemon wedges. Sprinkle some more black pepper on top. Can't hold on to the yolk any longer. Depending on how spicy the chilies are, that runny yolk can actually help soothing out some burning pain if tears start falling down.